Wilson Reading System® (WRS) instructional materials provide teachers with the tools needed to implement a multisensory structured literacy program. 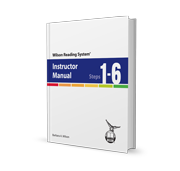 Instructor Manual (Steps 1-6)*: This manual is easy to navigate and contains new, revised, and expanded content incorporating the “what, how, and why” of Wilson instruction for Steps 1-6. The full-color, hardcover manual provides detailed instruction and explicit guidance for all parts of a lesson, including fluency and comprehension instruction in Block 3. The following sections are included: Introduction, Lesson Planning & Execution, Step Instruction for Lesson Parts 1-8, Comprehension & Fluency Block 3 Guide for Lesson Parts 9-10, and Appendix. Rules Notebook (Steps 1-12): Designed for teachers, this handy reference contains the basic rules that govern the structure of words in English. For each rule, a reference is provided noting the WRS substep where it is introduced. 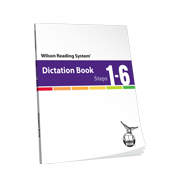 Dictation Book (Steps 1-6)*: This book provides content for lesson planning that reflects 4th edition updates. For each Step in the program, all content is arranged by “type” (sounds, word elements, high frequency words, phonetic words, and sentences) instead of by substep, making for easier lesson planning. This Dictation Book now includes word elements and high frequency word phrases for Part 8 of the lesson. The Dictation Book contains Level AB, Level A, and Level B vocabulary. Level AB includes words that are considered core vocabulary. Words that also are on the Academic Word List (AWL) are bolded in the wordlists and sentences. Letter-Sound Cards (Grapheme-Phoneme) Cards (Steps 1-12): These cards are used to develop quick and automatic letter naming and production of sounds for decoding, as well as to directly teach word structure by manipulating word parts. The 4th edition includes new cards: v-e exceptions, silent letters, and blank dry-erasable cards (ivory, salmon, and green). Word Cards (Steps 1-6)*: In Part 3 of the lesson, word examples are presented as a whole, rather than in parts, to solidify the conceptual understanding of word structure, develop automaticity, and extend vocabulary practice. Level AB and Level B Word Cards are provided at each substep for targeted practice of high utility words with taught word patterns. Nonsense words are included when appropriate. The cards are laminated so students can mark up word structure directly on the card. Word Element and Syllable Cards (Steps 1-6)*: The word element cards include prefix cards, suffix cards (including the suffix -s), and Latin-base cards. A selection of words are segmented into syllables, with one syllable per card. These materials are provided as perforated sheets for easy preparation. High Frequency Word Cards (Steps 1-6)*: High frequency words, whether phonetic or irregular, are used so commonly in English that they need to be recognized quickly and easily. 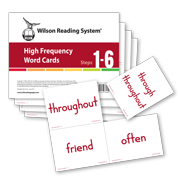 The High Frequency Word Cards are used to assist students with the automatic recognition of these words which include both phonetically irregular words and words with regular phonemic patterns that have not yet been taught. There are 242 high frequency words presented in a predetermined sequence in Steps 1-6. The words are also included in sentences, phrases, and stories for practice. Wilson Assessment for Decoding and Encoding (WADE): The purpose of the WADE is to determine entry into the WRS program and to set reading goals and pacing targets. Alternative forms are provided for reporting on student learning outcomes in relation to progress through the WRS curriculum. 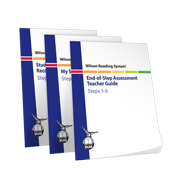 End-of-Step Assessment Teacher Guide provides general administration directions, instructions for scoring, and specific guidelines for progression to the next Step. Student Progression Recording Forms (consumable) are employed by the teacher to record each student’s errors. My Step Progress Booklet (consumable) is used by each student for the assessments as well as to chart progress. Wilson Academy/Intensive Learning Community: This online resource provides an animated version of the instructor manual with video support and a web-based community for teachers implementing WRS. It also contains additional resources, such as: printable materials, expert tips, enriched and non-controlled decodable text passages, and discussion boards. The Community also includes guidance to teachers on considerations for English language learners whose first language is Spanish. Membership in this Community is provided to individuals that have engaged in WRS professional learning. 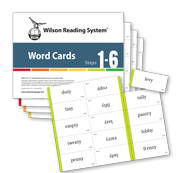 Wilson Fluency/Basic: Designed to provide explicit fluency instruction and reading practice, this resource can be used with students to develop the application of skills with connected text. It specifically corresponds to Steps 1-3 of WRS. *Please be aware that 4th edition materials for Steps 7-12 are currently in development for the 2019-2020 school year. If working with students in the upper steps, 3rd edition materials for WRS Steps 7-12 continue to be available to support instruction.